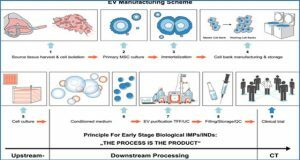 Circulatory microRNAs contained within extracellular vesicles (EVs) in biological fluids have developed great interest, due to their potential as non-invasive biomarkers. A variety of methods have been used to isolate EVs and their RNA content. Endogenous controls used for normalisation of cellular microRNA qRT-PCR studies may not be present in EVs. The exosome precipitation reagent supplied by Life Technologies performs better than competitor regents or ultracentrifugation and the Qiagen miRNeasy™ RNA isolation kit gives sufficient RNA recovery. HY3 and U6 are optimal controls for serum EV miRNA expression analysis, while HY3 and RNU48 are suitable for urine studies. Such reports should aid in the standardisation of EV microRNA isolation, increasing the validity of study comparisons. MicroRNAs are small regulatory molecules that demonstrate useful biomarker potential. They have been recognised in biofluids, where they are protected from degradation by encapsulation into extracellular vesicles (EVs). A number of commercial products are available for the isolation of EVs and their RNA content; however, extensive protocol comparisons are lacking. Furthermore, robust qRT-PCR assessment of microRNA expression within EVs is problematic, as endogenous controls (ECs) previously used in cellular samples may not be present. This study compares EV isolation and RNA extraction methods (EV precipitation reagents, RNA isolation kits and ultracentrifugation) from serum or urine samples and evaluates suitable ECs for incorporation into qRT-PCR analysis. Extracellular vesicle NanoSight and electron microscopy data. 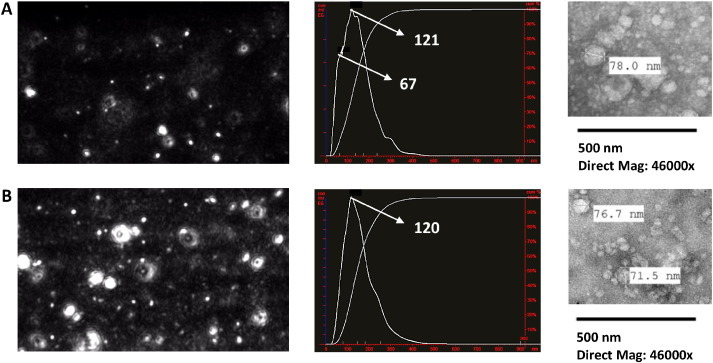 Example NanoSight NTA video frame, NanoSight NTA particle size/concentration and electron microscopy image for (A) SBI recovered EV pellet and (B) LT recovered EV pellet. A total of 3 readings were taken for each of the 3 samples. Reading #1 for sample #2 is shown. Results were assessed by electron microscopy, nanoparticle tracking analysis and bioanalyzer concentrations. The stability of 8 endogenous controls was compared for both urine and serum EV RNA and retrospectively validated in independent cohorts (serum n=55, urine n=50). The Life Technologies precipitation reagent gave superior serum EV recovery compared to SBI reagent, as assessed by NTA size distribution, increased RNA concentration, and lower small RNA Ct values. Similarly, the NB Urine Exosome RNA Isolation Kit gave improved results for urine EV isolation compared to ultracentrifugation, when determined by the same parameters. The Qiagen miRNeasy™ RNA isolation kit gave suitable serum EV RNA concentrations compared to other kits, as assessed by Bioanalyzer and small RNA qRT-PCR. Small RNAs HY3 (S.D=1.77, CoV=6.2%) and U6 (S.D=2.14, CoV=8.6%) were selected as optimal ECs for serum EV miRNA expression analysis, while HY3 (S.D=1.67, CoV=6.5%) and RNU48 (S.D=1.85, CoV=5.3%) were identified as suitable for urine studies. In conclusion, this study identifies optimal methods for isolation of serum and urine EV RNA, and suitable ECs for normalisation of qRT-PCR studies. Such reports should aid in the standardisation of EV microRNA data, particularly for biomarker studies.